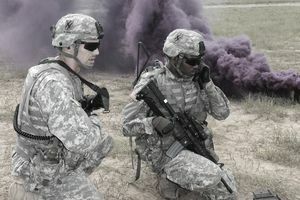 In the Army, adequate communication is important, especially in combat or field situations. Radio operator-maintainers are primarily responsible for all maintenance checks and services of radio communication equipment. Military occupational specialty (MOS) 25C has a wide variety of duties with a focus on keeping radio and other communication equipment up to date and working properly. The list of duties for this MOS is long, but it all comes down to keeping the radios working. Soldiers in this job will install, operate and perform preventive maintenance checks on radios, radio teletypewriters, and other communications equipment, including security equipment, vehicles, and power generators. Soldiers will oversee communication security and security policies, and implement electronic countermeasures as needed. Total compensation for this position includes food, housing, special pay, medical, and vacation time. If you enlist under certain MOS codes in the Army, you may also be eligible for certain cash bonuses of up to $40,000 if the HR specialist job is considered one of the Army's Jobs in Demand. Testing: You'll need to score a 98 on the Surveillance and Communications (SC) section of the Armed Services Vocational Aptitude Battery (ASVAB) test, and an 89 on the Electronics (EL) section. Training: Job training for a radio operator-maintainer requires 10 weeks of Basic Combat Training and 13 weeks of Advanced Individual Training with on-the-job instruction. Part of this time is spent in the classroom and in the field, for about three months at the Army's Fort Gordon in Georgia. Ability to qualify for a secret security clearance, which means you should have a record free of arrests or drug activity. Submission to a background investigation that will examine your financial records and include interviews with personal and professional references. Possess the ability to type a minimum of 25 words per minute and be a U.S. citizen. Once your military service is complete, you'll find that many civilian companies have a need for experienced radio operator-maintainer professionals. There's a variety of options for a post-military career, including jobs as a radio mechanic, radio operator or dispatcher. This training will prepare you for work in the telecommunications field, for jobs repairing and installing equipment, or as a supervisor of mechanics, installers, and repairers. The job of a radio operator-maintainer is performed in the field and can be located either on land or aboard a ship. Take the ASVAB Test and achieve the appropriate ASVAB Score of score a 98 on the Surveillance and Communications (SC) section and an 89 on the Electronics (EL) section. What Is a 25L - Cable Systems Installer-Maintainer? What Does an Avionic Mechanic Do in the Army?